One day he came upon a house, where he saw a bowl of the most beautiful apples. He took one in each hand and ran back into the forest. He sniffed the apples and smelled nothing. He tried to eat them, but hurt his teeth. They were made of wood. They appeared beautiful, however, and when the other monkeys saw them, he held onto them even tighter. 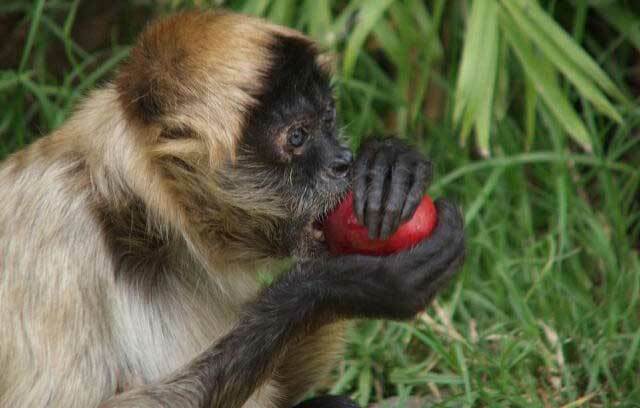 He held his new wooden apples proudly as he wandered the jungle. They glistened red in the sun, and seemed perfect to him. He paid so much attention to them, that he didn’t even notice his growing hunger. A fruit tree reminded him. He squeezed the apples in his hands, and couldn’t bear to let go of them in order to reach for the real fruit. In fact, he couldn’t relax, either, if he was to defend his apples. A proud, but hungry and less happy monkey continued to walk along the forest trails. The wooden apples became heavier, and the poor little monkey began to think about leaving them behind. He was tired, hungry, and he couldn’t climb trees or collect fruit with his hands full. What if he just let go? Letting go seemed crazy, but what else could he do? He was so tired. Seeing the next fruit tree, and smelling its fruit was enough. He dropped the wooden apples, reached up for his meal, and was happy again.